We would like to share our clinical experience with a patient with incomplete T7 paraplegia. The patient was admitted to 3 months after the injury. To walk, the patient needed two crutches. He was given an intense rehabilitation program with Lokomat and conventional therapy, and at the end of this program the patient was able to walk without crutches. The improvement we observed over the therapy progression encouraged us to share our experience to support other clinicians working with the same patient group. Please find below our case report including a description of evaluation, intervention and therapy progression including assessment scores given. A 65-year-old patient with no prior significant medical history presented with sharp lumbar pain and progressive weakness and numbness in his lower limbs. MRI imaging showed enhancing hyperintense lesions on both the T1- and T2-weighted images with destruction of the T7 vertebra and spinal cord compression consistent with spinal cord tumor. Histopathological finding revealed epithelioid hemangioma. He underwent operation that same day where a T6-T8 laminectomy and spinal cord decompression were performed. He was discharged to an inpatient rehabilitation center where he stayed for 2 months. From then on, he exercised at home twice a week. Could only walk with two crutches, Walking Index for Spinal Cord Injury (WISCI II): 16, Functional Ambulation Category (FAC): 3. Had fine touch sensation below the level of T10 diminished and impaired proprioception. Had muscle strength with LEMS (ASIA lower extremity muscle score) 42. 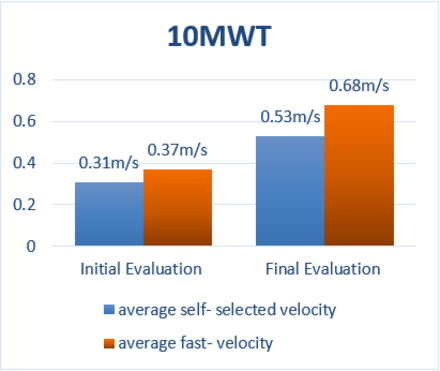 Had gait velocity during 10-meter walk test (10 MWT): 0.31 m/s for average self-selected velocity and 0.37m/s for average fast velocity. Had slightly increased muscle tone according to modified Ashworth scale (MAS): 1 for flexors and extensors of hip, flexors and extensors of knee, flexors and extensors of ankle. Did the Balance and Functional Mobility with Timed up and go (TUG) in 41.06 seconds. Had global functionality with Functional independence measure (FIM): 118/126. muscle tone regulation with spasticity reduction. We chose LokomatPro (Hocoma, Volketswil, Switzerland) to achieve our goals because of its therapeutic approach based on motor learning principles. The patient was also provided with interactive task-oriented training combined with neurofeedback. Such an approach increases the patient´s motivation and leads to better functional results. 60 sessions: 10 weeks, 6 sessions per week, every session lasting 45 minutes in addition to conventional physical therapy. The patient was guided through several treatment phases by adjusting the Lokomat parameters in order to increase his active participation. Walking speed was set to the maximum speed tolerated by the patient which allows the legs to be guided according to a physiological gait pattern and was gradually increased from 1.0 to 2.0 km/h. Guidance Force of the hip and knee motor drives was reduced from 100% to 40%. Body Weight Support was gradually decreased from 45 kg to 15 kg. After the robotic rehabilitation program the patient was able to walk without crutches. Training with Lokomat led to improvement of muscle strength, gait velocity, muscle tone, balance and global functionality. The findings from this case study suggest that Lokomat gait training is an effective method which facilitates motor recovery in a SCI patient 3 months after the injury. The improvement of overground walking function presents itself as a primary outcome of a highly intensive rehabilitation program, with secondary outcomes such as the improvement in the walking speed or lower extremity muscle strength. Our program of 10 weeks, 6 sessions per week of Lokomat intervention was built based on the principle that intensity and repetition matter. We will continue to implement its highly intensive use along with conventional physical therapy to achieve the best locomotor outcomes. The Polyclinic Glavić has provided medical services, examinations, and diagnostic procedures in the fields of neurology, ophthalmology, physical medicine, and internal medicine for almost 30 years. 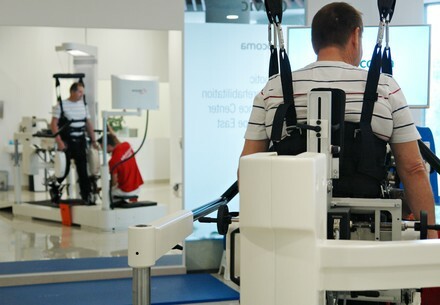 Treatment and rehabilitation of neurological outpatients throughout neurological services, robotic and conventional neurorehabilitation are also offered on an individual basis in the capital of Croatia, Zagreb. 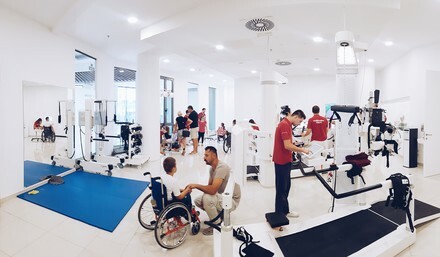 Today, the services of Polyclinic Glavić, a Neurorehabilitation Center in Eastern Europe, unite the best of technology, robotics, and know-how in neurorehabilitation and neurology. 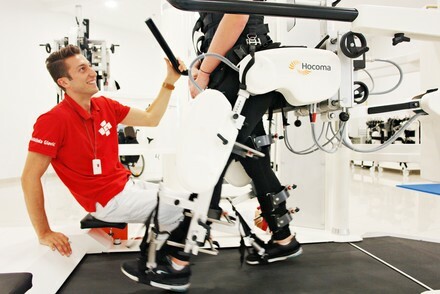 By using high-quality medical services that are significantly cheaper than in Western countries, by combining comprehensive medical knowledge, advanced technology, the most sophisticated robotics devices and well-trained and educated teams, we transcend the realm of “standard” neurorehabilitation (gait-, leg-, arm-, hand-, back-, balance therapy and more) in Croatia and the region. This clinical experience report is meant to serve as an example of how the LokomatPro integrated into a rehabilitation setting of a specific clinic. It is not necessarily a standard recommendation from Hocoma.